I saw this article and had to share. It’s makes so much sense and explains a lot of my daily to-do’s and/or stressors. How Do you handle “Kin-Keeping”? “You put her in the wrong outfit,” I said matter-of-factly as my husband came down the stairs holding our baby girl. He stared at me with a look of confusion and bewilderment, as if to say, But I didn’t know there was a right one. The short answer? Because I’m a mom. Just think about how different your own childhood would have looked without birthday cakes and family beach trips and homemade gifts for Grandma, and you’ll see how valuable these kinds of tasks really are. Here’s the problem, though: These incredibly important kin-keeping responsibilities are leaving moms emotionally exhausted. Why? Well, as I mentioned earlier, they almost always fall completely onto the mom’s shoulders. Even in households where there’s a fairly even division of labor, these tasks are overwhelmingly handled by women. Translation: It’s not easy to measure exactly how much time and effort you’re putting into remembering Aunt Cathy’s birthday or calling your husband’s grandma to thank her for the baby gift or making a last minute trip to buy more paper plates for the family BBQ. But these invisible tasks are sucking the life out of us. They’re (one of) the reasons our to-do lists never end, why we can’t turn our brains off at night, why it feels like we’re always forgetting something. These obligations seem to take root in the back of our minds and just sit there, forever, invading our ability to truly relax or take a breath. Did I remember to buy cousin Emily a wedding present? Who’s bringing the hot dogs for our camping trip? Shoot, it’s been way too long since we called your Aunt Susie! Geez, I’m feeling exhausted just writing about this stuff! So what do we do? How do we reclaim our time and our energy in the face of these seemingly endless kin-keeping tasks? The first step is simple awareness. Start paying attention to how much kin-keeping work you do. I bet you’ll be surprised! Then go ahead and ask for help completing these tasks—from your partner and from your kids, depending on their ages. If you get any pushback, remind everyone that while these little things sometimes seem silly and not worth the effort, they’re actually really important to maintaining family solidarity and continuity—and that having them fall entirely to one person is just too draining. In the end, a more equitable division of labor—kin keeping included—is better for everyone. And the best news? You might finally be able to turn your brain off at night. So, I’ll just jump right into it. October was a terrible, horrible, no good, very bad month. I was in a car accident at the end of September and that spiraled my life into a sea of insurance phone calls, rental car pick-ups and drop offs, doctor appointments, physical therapy, finding a new therapist, car hunts and car purchasing. Not to mention sleepless nights due to bad dreams from the accident and fatigue like nobody’s business. So, we needed some encouragement. Like real, hard-core, life-affirming encouragement. Not just those friendly pats on the back with the occasional “It’ll all workout.” And where, pray-tell, do you get that kind of encouragement? The BIBLE! Not to go all Southern-Baptist on you, but there is nothing like soul-shaking affirmation from God right to your mind and heart. We needed lots of that, continually. So, we researched…verses about perseverance, verses about fear, verses about children, and came up with quite a few that we fell in love with. To make it festive, we wrote the verses on neon note cards (like, almost glow-in-the-dark neon) and thumb-tacked then to a fabric-covered cork board. I can’t tell you how many times I’ve looked at and been restored since we made it. Just a hint, I’m thinking of making a portable version to those moments of emotional and spiritual depletion and I’m not at home. I highly recommend this, for everyone. So, it dawned on me the other day that I literally have four jobs…four. Yes, two require my presence once a week and one is from home. The last, which is actually my first, takes the most time, causes the most headache, pays the least and, ironically, gives the greatest reward. You guessed it. That last one would be my home (such a short word for everything that goes into it). So, household exec+ 3 other jobs+ leadership positions in two organizations+membership in 2 (other) organizations+church (don’t pay attention to the order these items are listed in)+ doctor’s appointments and physical therapy…yea, you’re probably tired just reading it and this is my life… Every. Single. Day. How I’m gonna throw loving parent in that list in a few months is literally beyond me. Yes, I know the logical thing to do is cut-back and step away from things but so many other wives and moms do so much more with so much less. They just wake up, adorn their capes and take-on the world. They. Are. Super. Their powers vary and most of them have more than one super power. Well, I’m super too. So super that I know when to ask for help. And by ask, I may mean sulkily confront my husband about not being able to do it all by myself and needing help while washing and possibly throwing dishes. The details aren’t important, right? The point is all these super-wives and moms have super-strength…asking for help. It’s not easy. Sometimes it’s even demeaning but, like everything else, it needs to be done and we need to do it. Until next time…keep using that super strength. Then, after you realize this was quite possibly the dumbest thing you’ve ever done, the Four Horsemen of the Self-Depravity Apocalypse come charging in. Horseman 1: The act committed being stupid to YOU being stupid, like a senseless-buffoon. Horseman 2: Doubting every other decision you’ve made or act you’ve committed, no matter how smart you thought they were at the time… Not to mention how all the other dumb decisions you’ve made just start making back-to-back cameo appearances in your mind. Horseman 4: We’ll call him ‘Dawn of The Drama’. The pity parties, the water-works that start slow and steady and end with colicky moans and body spasms commence and never seem to end. So besides curling up in a ball and letting the Horsemen above pummel you into a slow agonizing restless death-I mean sleep- although (thanks to Horseman 4) you thinking you’re dying isn’t that far off- what can we really do? Rectify the situation? Honestly, that’s not possible many times BUT if it is take full advantage of the opportunity of possible reprieve! Can’t rectify it? Well, I guess we have to let it go…another problem. For however many hours, the horsemen are stalking your every move and all you can think and feel is that stupidity so ‘letting it go’ seems way above your power limits at the moment. Well, if that’s how you feel, I’ve been there, and I’m there now but are we gonna give our power to 4 proverbial horsemen in our head? I mean, we invited them in so surely we can kick them out! It’s already been decided we’ve done some dumb things so how about changing that pattern? Let’s give the Horsemen, the real senseless buffoons, the boot and get on with our lives. We already recognized our wrongs, let’s focus on what we do that’s right. Until next time… Keep those horsemen out of your head. You know that bible verse, “Be still and know that I am God”? It took me a very long time to to understand its meaning. In fact, I still have to be reminded. I am a planner. I am a strategic thinker. I am a mover and a shaker. I don’t do still…like, literally. So, for so long, I couldn’t understand why sitting still drew you closer to Him and His plan for you. And then I had no choice but to sit still. Let me back up and define ‘no choice’ as it pertains to me- I planned, I strategized to get where I wanted to be and I moved and shaked until I could no longer move and shake. I was left with nothing. I felt empty. I felt like a failure. I. Me. The funny thing about those last two words (I. Me. ), as powerful as they are, they don’t contain God. All the planning, all the strategies, and all the moving I did didn’t start or end with God. So, when all was gone, that’s when I understood ‘still’ the way the bible intends. Still isn’t solely the physical nature but that of your spirit, stilling your heart and mind availing them to God and submitting to His will. I am not ruling out the physical definition of still at all, I’m just saying the stillness must start in your heart and encompass your body. Back to what got me to stillness…I won’t bore you with all the gory details (depression, anxiety and fear…OH MY!) but let’s just say that, because I was driving myself, I drove straight into a brick wall. At the impact I said ‘Ok God. I will do this Your way now.” And just like that, my heart and my mind submitted to God and my body moved under his direction. That’s the reason for all the words you’ve read here on hitswiththemrs.com. I’ve always wanted to write and help people with my writing. I just had to do it on His time, not mines. What you have read and what you will read helps my life as a Christian woman, wife, daughter, sister and friend and I pray it helps you. I’m back with another post for the She Shares Truth Challenge by She Reads Truth. Today we are reviewing 1 Corinthians 2:1-5. Last Sunday, I was inspired by the man sitting next to me at church and wanted to share the following with you all. Then, God answered with the She Shares Truth verse for this week. Let me know what you think! To the man sitting next to me in the pew, you don’t know me or I you but you taught me something that I will carry in my heart. To the man sitting next to me in the pew, I noticed you give all you could in the collection plate. The pennies, nickels and dimes that barley totaled $1 moved me in ways you will never know. To the man sitting next to me in the pew, I know you put on your best to come to church today. While I got up and changed my outfit three times, you put on dated hand-me-down jeans and a shirt that was too big. To the man sitting next to me in the pew, I saw you take your old bible and be steadfast and attentive through the sermon while I used three electronic devices to follow along and enjoyed my protein shake. To the man sitting next to me in the pew, thank you for reminding me what Jesus needs from us. Thank you for not being ashamed of what you brought to The Lord, what you wore to worship Him, and, most importantly, not letting any of that stop you from coming to church. To the man sitting next to me in the pew, thank you for inspiring me to draw closer to God and not to things or appearances this world tells me I need. Thank you for reminding that what I give to God should only be validated by God and not what the person next to me gives. To the man sitting next to me in the pew, what you taught me today was just that, a lesson, not condemnation. You don’t have an address and I don’t know where your next meal will come from but the joy in your heart is remarkable and God rewards the dutiful like you. To the man sitting next to me in the pew, thank you. I’m back with week 4 of the She Shares Truth Challenge by She Reads Truth. This week we are studying Jonah 3 and 4. Have you ever been upset because something bad didn’t happen to someone? (I know that sounds terrible but let’s take a little time to look at ourselves.) Upset because a person didn’t get what you felt they deserved? Upset because you had to forgive someone for what they did to you? If not, my hat is off to you. If you have, come join the club with Jonah and I. You see, once Jonah was spared by God’s grace and was obedient to His command, the people of Ninevah fasted and wore burlap to show sadness. They didn’t want God to destroy them so they sacrificed with hopes that He wouldn’t. They confessed their sins and made efforts and promises to change. So, God spared them and that’s what upset Jonah. It would’ve upset me too. The thing you, me and Jonah need to realize is that same grace that was shown to so many people who we believed didn’t deserve it was shown to us many, many, many times. We can’t determine where or how our great God shows His grace and mercy, but we can choose to be grateful for the grace and mercy He has shown to us. 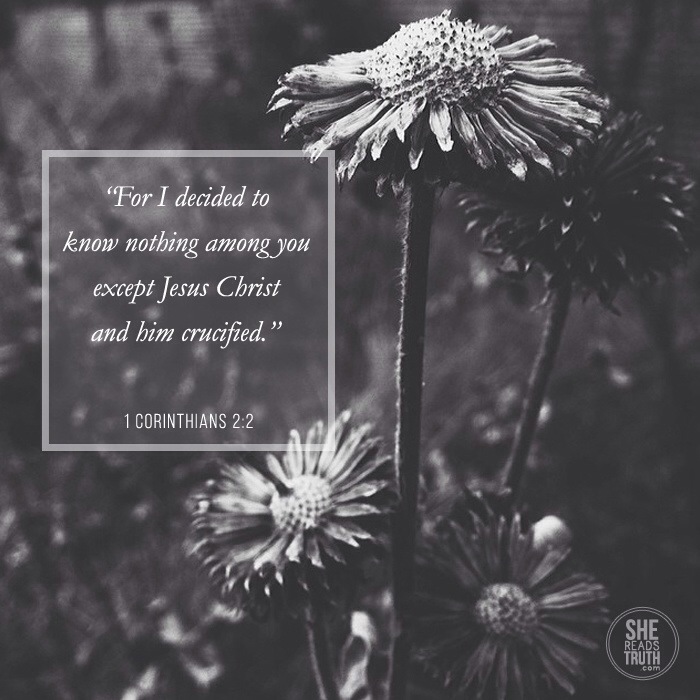 So I am back with another post for the She Shares Truth Challenge from She Reads Truth. This week’s post comes from Psalm 38. Let’s talk about guilt. Personally (and sadly) it is often a motivator for me. Sometimes, I go to the gym and refrain from things I want (but shouldn’t have) because I will feel guilty if I indulge. I attend certain events because I will feel guilty if I don’t. For too many women, guilt is a common emotion and a natural response to things. Thankfully, our Father knew that and left us great teachings. The author of Psalm 38 is my favorite king, King David. You see, like us, David knew about guilt. In fact, he knew it pretty well. He made some bad decisions, the kind where that guilt would just overtake my being. However, David’s story isn’t about his guilt, it is about redemption and praise and that can be our story too. Psalm 38 begins with the fears and guilt we, as humans, face often. Like David, we pursue good and evil comes. We too can call on our Savior in our times of need and guilt and He will come quickly to help us. David praised God for a Savior that was to come generations after him. We have a risen King that has already come and will come again. Our Lord knows what we long for and desire, when we feel alone and deserted, when we feel guilty and He saves. He stands by you, heals the hurt, absorbs the guilt and saves.